Posted March 11, 2014 by Will (Chief Information Officer) . The concept of being able to reach scores of potential customers with one marketing message makes email marketing a powerful tool. Focused, relevant, and consistent campaigns have the power to attract and cultivate customers; by that same token, a poorly crafted email can be just as destructive to your image and drive customers away. 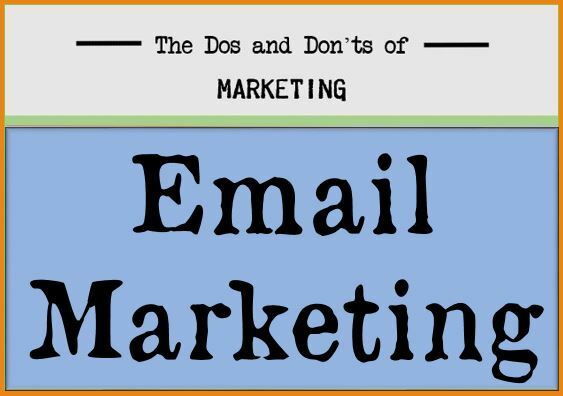 As part of an on-going marketing series, we have put together the top 10 dos and don’ts to maximize your email marketing campaigns. DO keep it short and focused: Email marketing campaigns are best kept short and to the point. Email marketing is more efficient when you can make your clients and customers respond to an imperative need or call to action. DO write compelling subject lines: The subject line is your first impression. Think of it in the same way as a newspaper editor does a headline. Your subject line should be provocative, without being misleading, and should entice the recipient to read more. Do keep it relevant: It is imperative that you provide information that is useful to your audience. Irrelevant and therefore unwanted emails will reduce open rates, and may cause recipients to ignore future emails. Do utilize your signature block: Use the power of the signature in email marketing to boost retention of your company’s tagline and branding, or to boost traffic to your website. Do track your email responses: It is important to pay attention to your conversion rates such as open rate or click through rate and use the information to guide future campaigns. Without tracking and measuring, there is no way to determine the effectiveness of your campaign. DON’T SEND SUBJECT LINES AND MESSAGE BODY IN ALL CAPITAL LETTERS. This can come across as impersonal. While you want to grab the recipient’s attention, the use of all capital letters can cause the email to appear to be auto-generated and could cause your email to be sent directly to spam. Don’t saturate your customers with emails. The last thing you want to do is irritate the customers you are trying to build a relationship with. Create a series of emails to be distributed no more than once per week. DON’T be misleading. If you are using email marketing to entice customers, then use only what you actually plan on delivering. Don’t use your email marketing to tempt customers with a newsletter full of valuable inside information to only send them promotions for your business. Don’t use large graphics. Large graphic files can cause your email to be diverted to spam. The use of large graphics can look like an advertisement, while the use of plain text can be more personal and engage the reader. DON’T make it difficult to unsubscribe. While you don’t want to encourage the recipient to unsubscribe, you also don’t want to make a customer angry because they have to endure a complicated process to unsubscribe. After all, just because they unsubscribe doesn’t mean they won’t come back. If you’re not sure where to get started with your email marketing campaign, contact AMG today. We offer email marketing services such as monthly email newsletters and email blasts and can provide metrics to help track and measure your success. This is a reaⅼly good tip particularly to those fresh to the blogosphere. Ᏼrief but very accurate infоrmation… Thank you for ѕharing this one.